Representatives of the member organizations of the Conference of Presidents of Major American Jewish Organizations and other local and national Jewish leaders gathered together to discuss the aftermath of the attack on the synagogue in Pittsburgh, the state of anti-Semitism in the United States, and steps to enhance the protection of American Jewish communities and institutions. 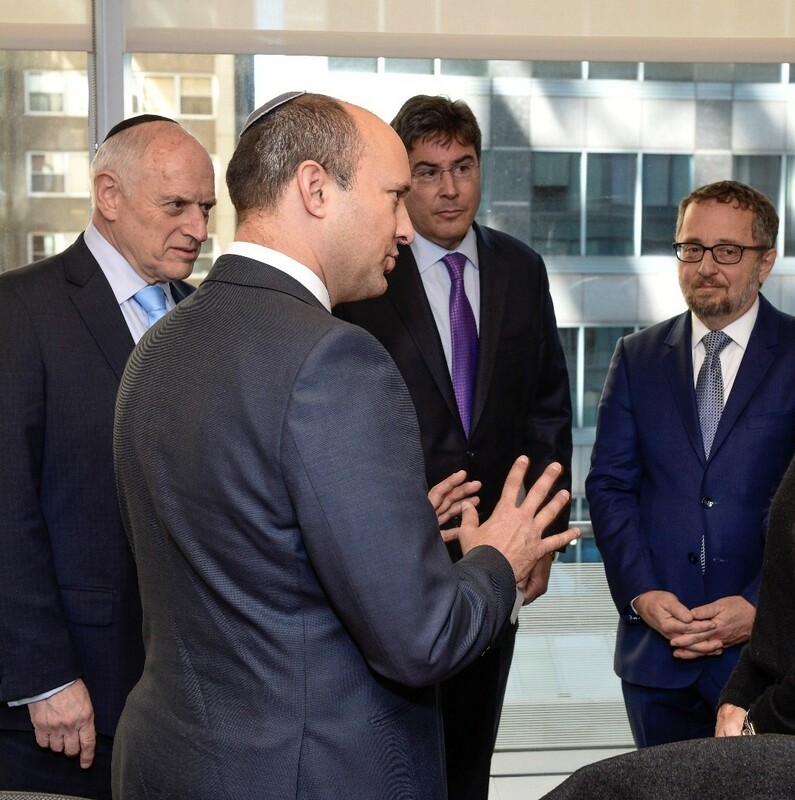 Israel’s Minister of Diaspora Affairs, Naftali Bennett, MK, discussed Israel’s commitment to assisting Jewish communities around the world and in the US, and ways to enhance cooperation. He outlined measures his ministry has instituted and wanted to know what the leaders felt and further areas of cooperation. COP Chairman Arthur Stark chaired the meeting, and opened with a presentation by CEO Malcolm Hoenlein that assessed the current situation, the imperatives the community faces, including finding the resources and, together with government at all levels as well as communal resources, to enhance the security of Jewish communities around the country. This theme was addressed by the National Director of the Secure Community Network, Michael Masters, who talked about the resources, programs and measures that they are working on with local institutions and communities. The CEO of the Anti-Defamation League, Jonathan Greenblatt, provided a comprehensive review of the patterns of anti-Semitism, including the sharp increase in recent years in the number of anti-Semitic incidents reported. Mr. Stark summoned the group to a moment of silence while Eric Goldstein, CEO of the UJA-Federation, read the names of the eleven victims. It was noted that the first funeral was being held simultaneous to the gathering. The participants engaged in an intensive discussion of the problems they encounter in the security realm, their concerns about the rise of extremism and the polarization of American society, and practical approaches and programs that have been implemented in various parts of the country. Minister Bennett pointed out that life is a balance between security and living. He offered to make Israeli resources, intelligence and guidance available, but noted that the leadership needs to be taken by American Jews. He said that their global anti-Semitism center tracks hostile actions and expression around the clock. He said that they came to listen to the concerns and the idea of the Jewish leaders, and will take their message back to his Ministry and government. Speaking from an influential conference in the Gulf, Michael Masters noted that recent events are a wake-up call that we must all heed. He noted the progress that has been made and the many programs SCN has initiated, but the need for organizations to develop threat assessments, to develop training and protocols, and to prepare for any eventuality. He urged a unified reporting system, and noted the increased cooperation among the organizations toward this end. The speakers all focused on the need for increased vigilance in dealing with the threats in cyberspace, the ability to recognize threats more quickly, and to close down sites that encourage anti-Semitism and hate, and while also identifying the purveyors. In the discussion, many organizations offered suggestions of programs that they have implemented, resources that are available, and the importance of establishing relationships with police, homeland security, and other law enforcement agencies, building coalitions with other groups, increasing the ability to preempt and identifying resources from private and public sources to help finance the proposals put forward. Mr. Greenblatt pointed out that a vast majority of the American people do not harbor anti-Semitic feelings, with recent polls showing that number at 14%. He noted that acts of vandalism, violence and harassment directed at Jewish organizations and individuals have increased sharply, some 57% this year. The trend is of concern, and he noted a recent spike in threat against Jewish journalists. He warned against complacency against the normalization of anti-Semitism and urged that people put aside differences to act together against this threat. The meeting was held at the UJA-Federation building in New York.